Should government products adhere to industry standards or rely on proprietary solutions in today’s environment? Opinions vary on this subject. Boeing continues its support for the U.S. Air Force Global Positioning System (GPS) program, delivering four GPS IIF satellites into service in 2014. Doing Away With Battery Fade, Thanks To MEPS, By Jonathan Kasper, Project Enginner + Greg Semrau, Systems Engineer, Moog, Inc.
A satellite’s electrical power system (EPS), typically based in solar cells and batteries, can be taxed with development of new loads and use cases. 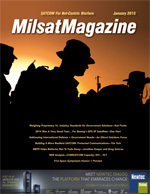 With the rise of network-centric warfare, the connectivity and situational awareness delivered by SATCOM has never been more vital. Potential adversaries are experimenting with ways to disrupt the satellite bandwidth that provides our forces with critical ISR superiority in theater. The annual Space Symposium provides an ideal opportunity for the Space Foundation to present its top awards. For 2015, the Board of Directors of the Space Foundation unanimously selected Jean-Jacques Dordain, Director General of the European Space Agency (ESA), as the recipient of its highest honor—the General James E. Hill Lifetime Space Achievement Award.